Madison, Wisconsin’s BEREFT formed in 2011; a Doom/Post-Black Metal quartet who have release a Demo and their debut full-length in 2014. Beyond this, I wasn’t able to gather any additional information on the band. So, let’s get to the music. “Lands” is their latest effort, and contains four extended songs, with a total running length of close to forty-five minutes. “We Wept” doesn’t waste anytime establishing an excessively low, slow and heavy sound. The fuzzy guitar notes linger as vibrations that would rattle your soul from within. Vocally there is some nice variation from deep Death growls to higher end screams and cleans as well. For me, it’s the held lamenting cleans that best reverberate the gloomy sound, though all three approaches are effective. Near the seven-minute mark, the track shifts, gaining some pacing for a while before back to the lumbering grind. “The Ritual” is the shortest song on the album, at just eight-and-a-half minutes. A three note guitar pattern leads in, from acoustic and then to electric. At over three minutes, the pace quickens as the vocals trade off from Death to Black. Another hulky riff takes over and leads the song to completion. The extended vocals and guitar notes are absolutely gut-wrenching. “In Filth” is a nine minute affair, where cymbal crashes and drum thuds lead in the sound. The vocals wail like the cries for help from a dying man alone in the wilderness. 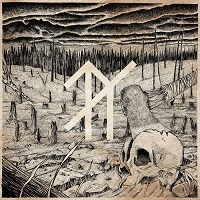 I have to say that there isn’t a strong Post-Black Metal song in the first three tracks. Not for nothing, I just hear a much stronger Doom sound…that permeating greyness of hopelessness, despair and the stench of death. “Waining Light” is the near fifteen minute closer. The opening ambiance is where some Post Metal elements come into the fold. Or, atmospheric type Metal. The fade-in allows you to take some breaths before the abhorrent dread returns. It’s an aptly titled song…the light could signify the purity of the world, and as it wanes and slowly turns from grey to black, all you can do is slowly, agonizingly, mourn the loss of all that you know. The passages of blast beat drumming are like some extra foot stomps on your head to make sure you are completely gone. At just before nine minutes, the agony fades and you are left to ponder with some clean guitar notes that are like chimes in the wind. Realizing your suffering has no end, the vocals reach an anguish factor that may be unparalleled. The glittering melodies that carry the song to completion are a nice final touch. I gotta say—the weight of this album is substantial. I can’t image any fans of the Doom genre not being able to connect with the emotional void that it leaves on you. Immerse yourself in the quicksand for the slowest and most tortuous death you can imagine.